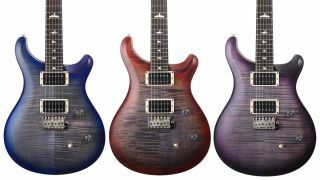 PRS is capitalising on the success of the revived and well-reviewed CE 24 with a new CE Satin Nitro model. Complementing the recently launched CE 24 Standard Satin, the Satin Nitro is a limited-edition model, sporting a satin nitrocellulose finish in three unique 'burst finishes: Faded Grey Cherryburst, Faded Grey Blueburst and Faded Grey Purpleburst. Not just distinctive lookers, the models offer a sleek 'black out' neck, as well as the original's formidable spec list, including shallow carved maple top, mahogany body, Wide Thin maple neck and bird-inlay'd rosewood fingerboard. PRS's coil-splittable 85/15 humbuckers are also onboard, as are the company's Phase II machineheads and tremolo/vibrato system. Feeling 'bursty? Just 150 of these beauties will be available in Europe, Japan and Australia, weighing in at £1,999 / €2,349, including a PRS premium gigbag.